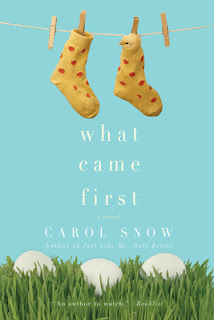 Please join me in welcoming Carol Snow, author of What Came First, to The Book Chick today! If you missed my review you can find it here, and be sure to scroll to the bottom of that post and enter the giveaway (2 copies, US only, ends October 26). For the past sixteen years (I also have an older daughter), my life has revolved all of the things that mothers’ lives revolve around: the sleeping, the eating, the illnesses, the accidents. The music lessons, the playdates, the birthday parties, the scout meetings, the sports. Oh my, God – the sports! Over the years, my kids have done soccer, basketball, baseball, golf, swimming, and gymnastics. I’m sure I’m forgetting a few. Some days, it feels like all I do is drive. In the middle of all this, I have managed to write some books: seven have been published in the past five years. My house is very, very messy. The other night my daughter asked for some help with a creative writing assignment. I said sure, I’d help her (making sure she understood the difference between “help” and “do”). “I know a little bit about that,” I quipped. Her response? “Oh yeah – you took a creative writing class in college, didn’t you?” She wasn’t even joking. While my books aren’t autobiographical in the least, as a rule, I don’t tackle any life stage till I’m far enough past it to look back with something at least vaguely resembling objectivity. Several years ago, I had an idea for a multi-perspective book about a woman searching for her son’s sperm donor. I don’t even remember where the idea came from exactly, but I’d read some articles about sperm donor children searching for their biological relatives, plus I had several single friends who were contemplating motherhood. Still, I didn’t think I could pull the book off –not because of life stage issues but because I didn’t know anything about being a single mother, and I’d never had to deal with infertility or assisted reproduction. A couple of years ago I was trying to come up with an idea for a new book when I remembered the sperm donor idea and suddenly knew that I could write it, after all. Maybe I was at a new life stage. Maybe I was surprised that I’d had no trouble writing from a single mother’s perspective in my previous book, Just Like Me, Only Better. Or maybe I was just getting desperate. But for some reason I realized that the book that would become What Came First was, at its core, about motherhood. It doesn’t matter whether you’re a girl scout leader or a CEO; whether you got pregnant on your first try or your thousandth; or even whether your children came from your body or carry someone else’s DNA: once you become a mother, your children are the most important thing in your life, no matter how much of your day you spend with them. Period. And children don’t just change your life – they actually change who you are as a person. I wrote What Came First in three different first-person voices (which some days left me feeling like I suffered from multiple personality disorder). Laura is a successful lawyer and single mother to Ian, an angelic eight-year-old whom she raises with the help of a devoted nanny. Wendy is a frazzled stay-at-home mom to two demonic five-year old twins. Finally, Vanessa is pushing thirty, longing for children, and stuck in a dead-end relationship. The three main characters are all very different – and all flawed in varying degrees. But I found myself rooting for them all and forgiving them their missteps. After all, like mothers and future mothers everywhere, they’re just doing the best they can." Thank-you so much to Carol for taking the time to stop by today, and for Penguin for providing the review copy as well as co-ordinating the guest post.